Класификацията на динозаврите е започната през 1842 г., когато Ричард Оуен (на английски: Richard Owen) е отделил различните родове влечуги, като Игуанодони, Мегалозаври и Hylaeosaurus в отделни подраздели. През 1887 – 1888 г. Хари Сийли (на английски: Harry Seeley) разделя динозаврите в зависимост от тяхната тазобедрена структура на два големи разреда Saurischia и Ornithischia. 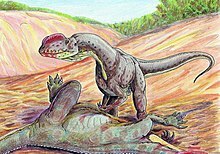 По-долу е показана пълната класификация на надразред Динозаври (Dinosauria) до ниво род. ↑ Yuong-Nam Lee, Michael J. Ryan, Yoshitsugu Kobayashi: The first ceratopsian dinosaur from South Korea. Naturwissenschaften, 2010. ↑ Michael E. Burns: Taxonomic utility of ankylosaur (Dinosauria, Ornithischia) osteoderms: Glyptodontopelta mimus Ford, 2000: a test case. In: Journal of Vertebrate Paleontology. 28, Nr. 4, 2008, S. 1102 – 1109. ↑ Kenneth Carpenter, Jeff Bartlett, John Bird, Reese Barrick: Ankylosaurs from the Price River Quarries, Cedar Mountain Formation (Lower Cretaceous), east-central Utah. In: Journal of Vertebrate Paleontology. 28, Nr. 4, 2008 S. 1089 – 1101. ↑ Yates, A. M.; Bonnan, M. F.; Neveling, J.; Chinsamy, A.; Blackbeard, M. G. (2010). A new transitional sauropodomorph dinosaur from the Early Jurassic of South Africa and the evolution of sauropod feeding and quadrupedalis. Proceedings of the Royal Society B 277 (1682): 787 – 794. ↑ Hocknull, Scott A.; White, Matt A.; Tischler, Travis R.; Cook, Alex G.; Calleja, Naomi D.; Sloan, Trish & Elliott, David A. (2009). New mid-Cretaceous (latest Albian) dinosaurs from Winton, Queensland, Australia. PLoS ONE 4 (7). ↑ R. A. Santucci, R. J. Bertini: A new titanosaur from western São Paolo State, Upper Cretaceous Bauru Group, south-east Brazil. In: Palaeontology. 49, Nr. 1, 2006, S. 171 – 185. ↑ José F. Bonaparte, Bernardo J. González Riga, Sebastián Apesteguía: Ligabuesaurus leanzai gen. et sp. nov. (Dinosauria, Sauropoda), a new titanosaur from the Lohan Cura Formation (Aptian, Lower Cretaceous) of Neuquén, Patagonia, Argentina. In: Cretaceous Research. 27, Nr. 3, 2006, S. 364 – 376. ↑ L. Salgado, I. Carvalho: Uberabatitan ribeiroi, a new titanosaur from the Marila Formation (Bauru Group, Upper Cretaceous), Minas Gerais, Brazil. In: Palaeontology. 51, Nr. 4, 2008, S. 881 – 901. ↑ John A. Whitlock: A phylogenetic analysis of Diplodocoidea (Saurischia: Sauropoda). In: Zoological Journal of the Linnean Society. 2011, S. 872 – 915. ↑ Choiniere, J. N.; Xu, X.; Clark, J. M.; Forster, C. A.; Guo, Y.; and Han, F. (2010): A basal alvarezsauroid theropod from the Early Late Jurassic of Xinjiang, China. Science 327 (5965): 571 – 574. ↑ Xing Xu u. a.: A basal tyrannosauroid dinosaur from the Late Jurassic of China. In: Nature 439, 2006, S. 715 – 718. ↑ Averianov, A. O. и др. A new basal coelurosaur (Dinosauria: Theropoda) from the Middle Jurassic of Siberia. // Proceedings of the Zoological Institute 314 (1). 2010. с. 42 – 57. ↑ Tyrannosaur paleobiology: new research on ancient exemplar organisms. // Science 329. 2010. с. 1481−1485. ↑ Henderson (2005). „Nano No More: The death of the pygmy tyrant.“ In: „The origin, systematics, and paleobiology of Tyrannosauridae“, a symposium hosted jointly by Burpee Museum of Natural History and Northern Illinois University.